The most powerful speech on American foreign policy this week comes from an Iranian, the Crown Prince of Iran. 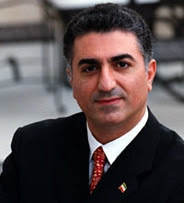 Reza Pahlavi is the former Crown Prince of Iran, the older son of late Shah Mohammad Reza Pahlavi and his Empress Consort, Farah Diba. In 1978, he moved to the United States to complete his higher education. He was trained as a jet fighter pilot at Reese Air Force Base in Lubbock, Texas and is a political science graduate of the University of Southern California. He has not returned to Iran since the 1979 Iranian Revolution and cannot do so without risking arrest, imprisonment, and execution while the country is under the Islamic Republic. Ladies and gentlemen, distinguished guests good afternoon. Allow me to express my gratitude for the invitation to be with you today. To many of you whom I know personally, I extend my admiration and respect for the great work you have done over the years. To those I meet for the first time, thank you for letting me have the privilege of getting to know you. The Hudson Institute’s proud tradition of service to world peace includes the great work of those, like Herman Kahn, who dared to “think the unthinkable.” You can imagine the depth of my sorrow that today, the “unthinkable” concerns my homeland. The latest Presidential National Security Directive names the Islamic Republic of Iran as the greatest threat to international peace, security and stability. That is principally because permitting the foremost state-sponsor of terrorism to acquire nuclear weapons is unthinkable. What has changed from Herman Kahn’s era is that mutual assured destruction (MAD) worked against a rival that defined its interests in this material world. Messrs. Khamenei, Ahmadinejad and many of their cohorts do not. How can assured destruction deter those who glorify self-destruction and call it martyrdom? Just as suicide bombing has changed domestic security policies, dealing with the nuclearization of this new kind of “other-worldly” state requires a different approach in international relations. Far from acting to avoid assured destruction, they invite it with tireless exaltation of martyrdom! Which brings us to the question, what could be done? President Reagan knew that he would not get behavior change from the Soviet regime unless he seemed serious about changing it. The actual change was a happy byproduct, which spelled the end of the Marxist mystique. East-European youth backpacked their way to the West to tell fellow students about the wide chasm between the deceptive promise of Marxism and its wretched reality. Long lines to take Marxist courses disappeared in Universities, from Buenos Aires to Paris. …Still, it was easier to talk favorably about regime change in 2004 or 2005, when Iraqis were celebrating free elections and the Cedar Revolution was gaining steam in Lebanon. That is when Tehran’s theocrats and Syria’s Assad sensed the danger and set out to kill the hope for democracy in the region. They exploited religious and ethnic divisions to create a quagmire as a no-trespass sign to the rest of the world: Shelve any plans for democracy in the region, from the subcontinent to the Mediterranean, and from the Caspian to the Persian Gulf – read the sign. As for economic pressures, recent history should have convinced us that they are not enough to change the behavior of a regime that does not care about the welfare of its people. In more than two years of negotiations, Iran’s major European trade partners, Germany, France and Britain played with numerous combinations of economic threats and incentives, before they threw in the towel. The International Atomic Energy Agency reported Iran to the UN Security Council shortly thereafter. In short, US foreign policy and international pressure are reaching their limit, while the government whose head denies the Holocaust and wants an entire nation wiped off the map, is inching ever closer to the bomb! Having removed the Taliban and Saddam – two walls of Iran’s containment – having approached the limits of diplomatic and economic pressures, many discussions of US options now teeter between war and surrender. Surrender, by the way, has a fascinating new name: Engage and Deter! We engaged China to get out of Vietnam, why can’t we do the same with Iran to exit Iraq? That was the question put to the Senate Foreign Relations Committee by a Council of Foreign Relations fellow, who seemed to put some Senators in deep thought. …In this new disguise for surrender, mention of deterrence is even less valid, but requires more insight to expose. During the cold war, nuclear deterrence gave the West an advantage: the Warsaw Pact’s conventional forces were quantitatively superior and nuclear arms acted as an equalizer in the European theater. In the Persian Gulf today, it is the US that has overwhelming conventional superiority. Should the Islamic Republic get the bomb, it will equalize that superiority and deter a high-intensity conventional attack. The nuclear shield will, thus, open the hands of the Islamic Republic to expand low intensity violence — a.k.a. terrorism — in furtherance of its constitutional mission of exporting Islamic Revolution. Hamas, Hizbullah, the Mahdi Army, the Badr Brigade and the like will then look ten feet taller than their intimidated moderate rivals. h harmful and deceptive advice, because it is ill-equipped to deal with unconventional states. …The Departments of State and Defense were not structured to help “velvet” revolutions, which have been the most significant patterns of positive change in the world since the Cold War. The problem is that the US does not have a third foreign policy department; one that understands, and can deal, with the peoples of the transitional world, not just their failed states. Is it all lost then? Are we back to war or surrender? Far from it! We haven’t focused on the greatest ally of the Free World in the Moslem World: the people of Iran. Three Iranian social groups, the women, youth and ethnic groups, as well as four professional and working groups, educators, lawyers, journalists and industrial labor, have been at the forefront of protests against and defiance of the Islamic Republic. Two of the top three Iranian cities, Tabriz and Mashhad, as well as other major cities, such as Sanandaj, have been out of government control, for days at a time. The principal reason why the vast majority of Iranians who want to reclaim peace and prosperity have not succeeded against the Islamic Republic is because they are prevented from communicating – with each other, and with the free world. Inside Iran, the government controls mass media with an iron fist. Even “Bloggers” with a limited audience are arrested, let alone published journalists – and there are more of them in jail than anywhere in the world. A must have for Iran’s pro-democracy movement is media that can connect Iranian activists inside Iran with each other. As I have mentioned before, there are a thousand circles of protest in Iran, but no nationwide medium to connect them. Since the government will not tolerate such a medium inside Iran, it has to be done from outside. I never miss a chance to reject military action against my homeland. I am against war. I hope you are too, and I can not believe that you would be for surrender. Thus, we are left with regime change vs. behavior change. And as indicated earlier, that is a false choice. So what is the right choice? Like most totalitarian leaders, Iran’s Supreme Islamist leader wakes up every morning wondering if the morale and ideological glue of his security forces will hold. To strengthen their spine, he feels he has to take tough, uncompromising stands against his ideological adversaries – liberal democracies in general, and the United States and Israel in particular. The reckless self-righteousness of his “other-worldly” ideology will continue this course, until a final collision. This behavior will not change unless he wakes up one morning with an even greater fear: seeing the Iranian people joining hands and rising up against his theocratic tyranny. Unlike forgetful analysts in the West, he knows the Iranian people have changed their regimes many times before, when they had far less reasons to do so. He watches carefully for the signs of history repeating itself. Once he sees those signs, and only then, will he change his behavior. That is why idealism and realism, behavior change and regime change do not require different policies but the same: empowering the Iranian people. This is my political mission in life. I ask for your support, and thank you sincerely for sharing some of your valuable time with me.